Charles Barkley joins "Jimmy Kimmel Live" on Feb. 14, 2018. Easily one of the best parts about the Eagles winning Super Bowl LII is seeing all of the celebrity locals geeking out over their beloved football team. Kevin Hart got trashed and tried to go on the victory stage after the game. We all saw Bradley Cooper develop an ulcer up in the owner's box. Questlove, Pink, Kobe Bryant and Mike Trout all had their moments of unbridled joy. Even Meek Mill stood in solidarity with the team from behind bars. Officially, nobody beats Charles Barkley. The former Sixers legend, who was in attendance at the NFC Championship game in Philly, joined Jimmy Kimmel on Wednesday night to talk about the Super Bowl and a few other topics. This is Barkley at his finest. Not only do we get a ton of love for Philadelphia fans, but we get to hear Barkley tell an amazing story from his Sixers days in his own words. It's been known for a few years that Barkley was briefly traded to the Los Angeles Lakers in 1992. The trade was rescinded before Philadelphia finalized a deal to send the star forward to the Phoenix Suns. When Barkley's agent told him he was going to L.A., the news kicked off an afternoon of heavy drinking. The trade, of course, fell through. And the Sixers had a game later that night. 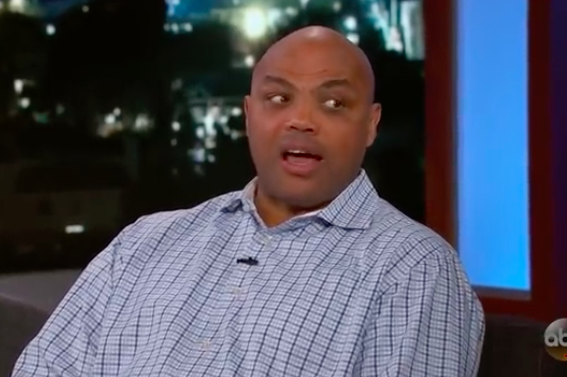 Finally, in case the world was curious, Barkley reveals his feelings about marijuana: "All it made me do was want to eat potato chips."